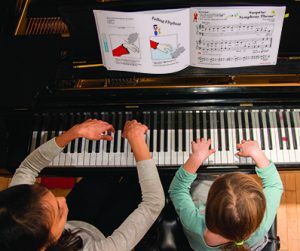 This takes us to the heart of technique and artistry: how we teach it, how we sequence it, and how we develop it step‐by‐step to bring out the “musical character” of our students. Another thing we know: it’s not going to happen for our students unless we teach it to them. We instruct through demonstration, imaginative metaphors, and well‐chosen repertoire. At each lesson we reveal our artistic engagement, physically and expressively. 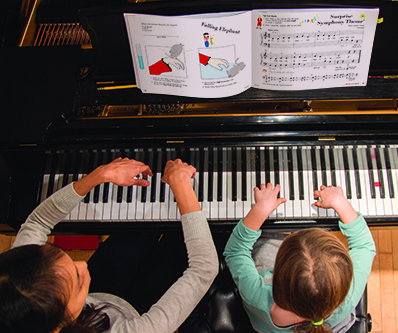 For there is a beauty of “sight, sound, and story” when a 5‐year‐old admirably plays Twinkle, Twinkle Little Star with a rounded hand shape, steady rhythm, and attentive focus. A round of applause and a big smile —Technique and Artistry! There is excitement in hearing a middle school student play the Burgmuller Ballade with a fine up‐touch for the R.H. chords and well‐articulated 16th‐notes for the rapid L.H. melody — Technique and Artistry! Learn more about technique and artistry at every level of Piano Adventures in our new 2017–2018 Catalog and Desk Reference.